I figured you could use some good news this week, so I counted it up and I am happy to tell you there are only 28 days til Spring. Yes I’m an optimist, even when my car tells me that it is 1 degree outside. We had our fair share of cold and snow and ice this week, but somehow we managed to get a ton of things done. The Arctic Blast created a few setbacks, but the guys and gals at Madison+Main are a hearty bunch. Monday, February 16th – Since Lindsey’s boyfriend Zak works for Norfolk Naval Shipyard, she has become a huge fan of Federal holidays and used one of her vacation days to celebrate Presidents Day. The two spent the day honoring America’s leaders by getting loaded in a bar called Gosport and playing Trivia. She won 2nd place after answering a question about hummingbirds and received a $25 gift certificate which she applied to her $80 tab (in other words she won a coupon). Meanwhile back at the office, we were working feverishly trying to beat the impending snow storm. Most of the crew bailed at 3 PM but Graphic Designer, Kaity Byrum and I stuck it out… because we’re the only two people in the office who drive Jeeps. Tuesday, February 17th – We declared Tuesday a non-operational day and let everyone off so they could play in the snow, but many of them chose to work from home and that’s why I love them. After spending most of the morning catching up on e-mail and reports, I took a break and dragged my kids around the neighborhood with sleds tied to the back of my Jeep. I call this “Shrednecking.” I have a video to prove it. No children or animals were harmed during this production. In the afternoon I talked with M+M VP of Operations (and my business partner) Molly Whitfield, who has temporarily settled in the tiny Southern Arizona hamlet of Sierra Vista. Molly and her husband,Lee have only been there for a week but have already eaten at every restaurant in town. After some quick research on the web I found that Sierra Vista is the Hummingbird Capital of the U.S., which I learned from Lindsey. I also learned that hummingbirds can fly up to 500 miles at one time. I am sure Molly will be thrilled to learn about all of this. Molly, for the record, is so organized that she’s having a baby on Tax Day, April 15th, which makes perfect sense because “little baby Cupcake” will be the couples first tax deduction. No word on what to name her, but I think Davida has a nice ring to it. Wednesday, February 18th – On Wednesday we were back at work and open by 10 AM since all the roads were clear (I still don’t understand why kids are not in school and neither does my wife Sue). We were able to update our clients’ CowanGates website on Wednesday, where we welcomed their newest associate Julia Childrey. Julia is a Family Law Attorney, a native of Richmond and a graduate of Randolph-Macon College, getting her law degree from University of Richmond. I even have proof that we updated the website. Welcome Julia, we look forward to working with you! Madalyn, Lindsey and I were able to drop by Sprocket Media Works on Thursday afternoon to congratulate our friend Patrick Bedall on his new venture. Check out Patrick’s new studio space one block away from Madison+Main’s International Headquarters on Foushee. 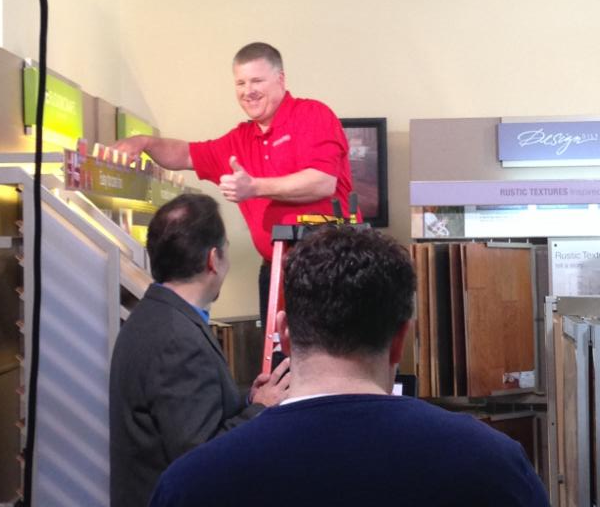 On Thursday we were excited to shoot the new Davis & Green Electrical TV spot with NBC12’s Creative Services Team. The new ad stars Chris, one of the Davis & Green team members and his left thumb. We were excited that Davis & Green President, Lynn Green and Marketing Coordinator Jennifer Robinson were able to join us. Special thanks to Costen Flooring America for letting us use their awesome space on Hull Street Road to shoot the ad. Chris from Davis & Green gives the thumbs up to actor Scott Car and Director Victor Nash. Friday, February 20th – Spring arrives on March 20th, 28 days from now. It’s important to remember that after seeing single digits on the temperature gauge on my car this morning. And looking at next week’s forecast, it’s looking like I’m going to have to postpone the Yard Works TV shoot again. Speaking of postponing, the Madison+Main Media Mixer was cancelled this week, but save the date, we’re back on for Wednesday March 18th at the Tobacco Company, just in time for Spring!